Brera Wine Library is a new way to interpret the space and a new way to store wine. Cellars, wine showrooms and restaurants find this innovative bottle display ideal for all storage needs and requirements. The stainless steel structure of this glass unit is the perfect frame for your wine bottles; it will add value and style to your collection and can be customised in different colours. 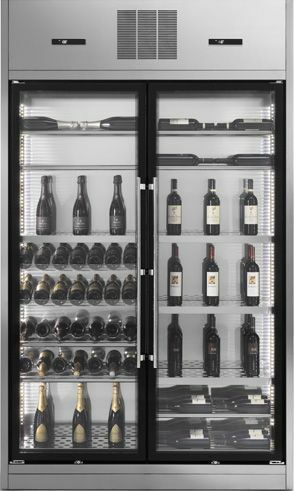 Additionally, the full-length glass doors and interior LED lighting system will make your bottles of wine irresistible. 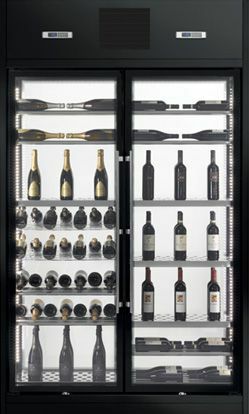 To meet all storage needs and requirements, Wine Library is available in different heights, 220 cm and 260 cm, and with different bottle storage capacity. The ability to set two different temperatures inside the unit allows to store different types of wines at optimal temperature and arrange the bottles according to preference using the choice of bottle-handling structures available. Your collection of wine bottles, your passion, has a place of honour in a bright and absolutely unique frame.